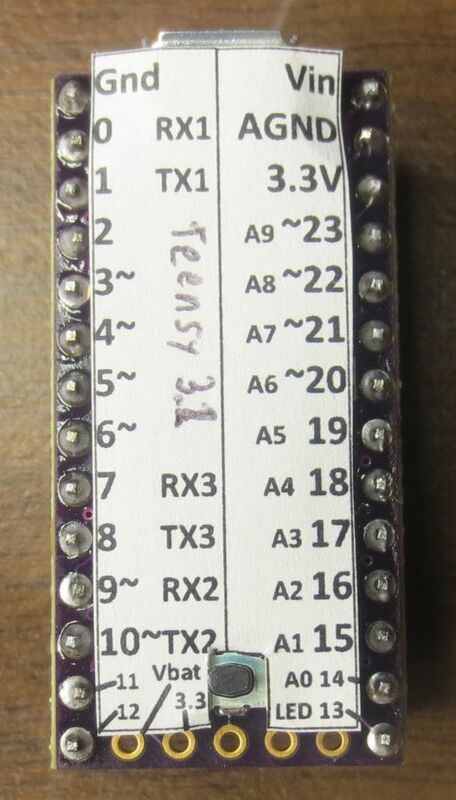 I just picked up a Teensy 3.1, which is an ARM development board that can speak Arduino. OSH Park was running a special where I could tack one onto my order for a few bucks. It’s pretty neat. The only downside is that the design doesn’t have pin labels on the top of the board. This makes it really tough to use in a breadboard. To fix this, I made a label to stick to it to call out the pins — posting here in case someone on the internet could use such a thing. Here’s the PDF, as well as the Microsoft Publisher source file. 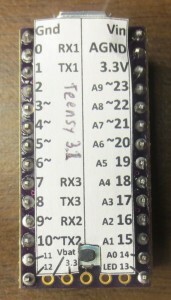 Unlike the photo, the linked label has the name of the board written in text rather than in ballpoint pen. Ax Man surplus in Minneapolis is a magical place. They have tons and tons of electronic and industrial surplus, plus a bunch of just general weird crap. It helps that the place is packed with the bizarre inventions of the owners and employees (robotic mannequins with mismatched limbs, motion sensing babies that cry when you walk by with a chilling robotic scream, etc.). Last time I was up there, I found a board with a bunch of seven-segment displays, a chip, and a 6-pin connector. I thought the chip might be an LED driver I could look up, so I took a $2 bet and bought it, figuring I might be able to reverse engineer it. What a waste for Tactile Systems Technology…a whole run of boards fully populated, thrown out because of a silk screen typo :-). That company is still around — they make medical gear, so I guess the thought of a life saving device with a typo was a non-starter. I just finished the Nickelphone! It’s a coin-based music keyboard. 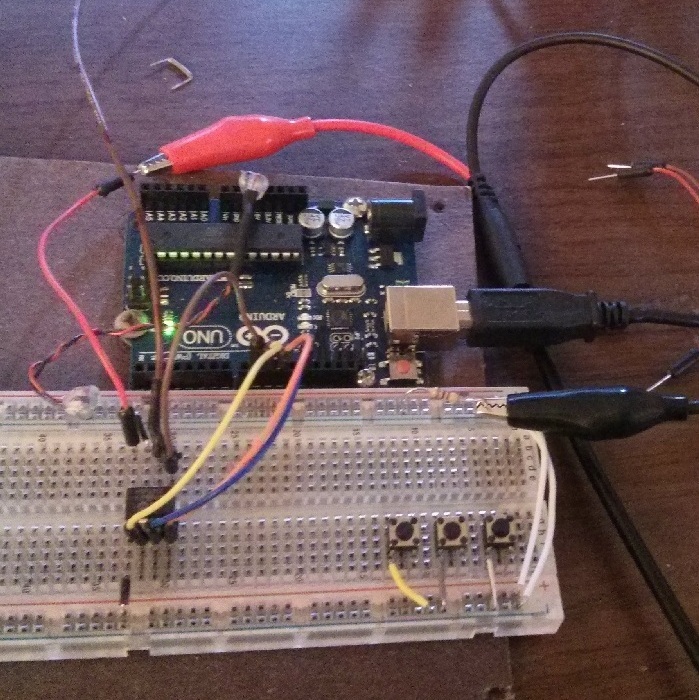 15 nickels and 10 pennies act as touch sensors on a traditional 25-key piano-style layout. It can emit simple square wave tones through an onboard piezo buzzer, but its primary use is as a MIDI keyboard, so it can drive a full synthesizer (like FL Studio on PC). 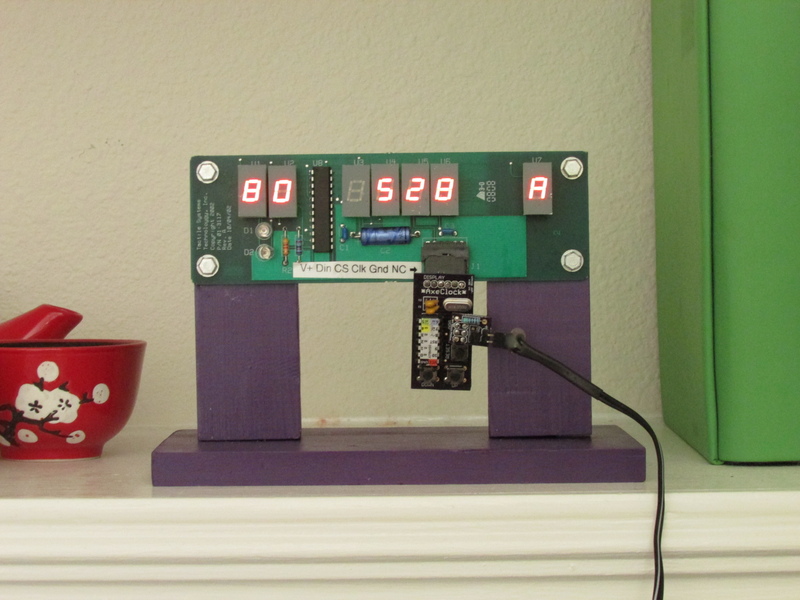 It’s based on an ATmega644 microcontroller, chosen because each key needs its own pin, and this chip has 32 data pins (8 of them analog inputs). (Also, it happens to be the chip I got for free in when I placed my Atmel free sample order.) It uses the “no extra parts” capacitive sensing method developed by Mario Becker and others. For the MIDI output, I used the “last darned MIDI interface I’ll ever build” by Stephen Hobley (just the output part, which just uses one resistor). 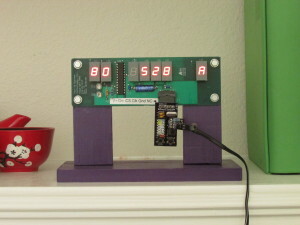 The software is written in Arduino, with the “core” for the ATmega644 chip being adapted from the Sanguino project. The Nickelphone was inspired by Linus Åkesson’s Chipophone and its follow-on, the bitbuf, both of which are totally awesome. Here’s an update to the Nickelphone (previous post here). It’s still made out of 15 nickels and 10 pennies acting as touch sensors on a traditional 25-key piano-style layout. It now has MIDI output and can detect any number of simultaneous key presses, so it works great with a full synthesizer (like FL Studio)! I still need to do a full write up, and make it a little more well-built. Here’s a work in progress video of my home-made musical instrument, the Nickelphone. It’s a coin-based music keyboard. 15 nickels and 10 pennies act as touch sensors on a traditional 25-key piano-style layout. It currently emits one tone at a time through a little piezo buzzer, but it will eventually emit MIDI signals so it can drive a full synthesizer (like FL Studio). 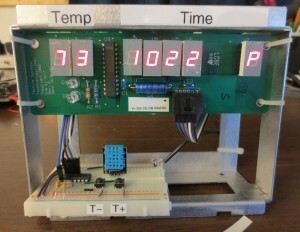 Based on an ATmega644 microcontroller and coded in Arduino with the CapacitiveSensor library for touch sensing. I’ll do a full write-up here when it’s done. 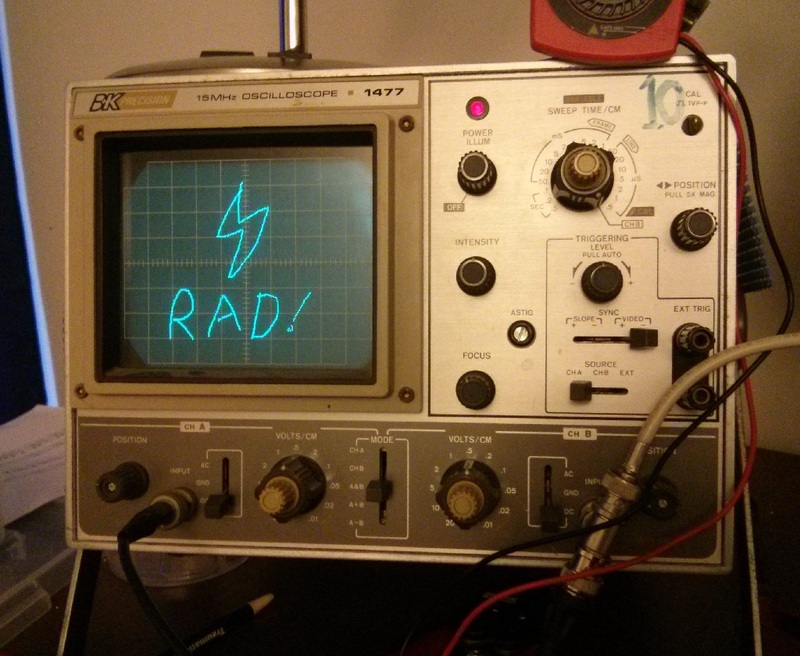 I have an old analog oscilloscope I got from university surplus, and it’s been more than enough for all the work I’ve done so far. One thing I’ve wanted to do for a while was draw arbitrary stuff on it using X/Y mode, recreating the vector graphics systems of the past, especially stuff like the seminal Tennis for Two. Unfortunately, a plain Arduino can’t output true analog signals–the analogWrite function just sets pulse-width modulation (PWM) so the pin is up x% of the time rather than truly being x% of the voltage. So I needed a digital-to-analog converter (DAC). I was originally going to build a R-2R DAC out of resistors, but that eats a ton of pins, so I wouldn’t be able to scale down to a smaller controller later if I wanted. Instead, I decided on getting a dedicated serial DAC, which is an IC that receives the voltage level via serial digital communication, then outputs it. Originally I tried to get a super-cheap audio DAC, the TDA1543, but the protocol for that is weird, and I got a non-standard “japanese interface” variant, and also I may have fried it. Anyway, it didn’t work, so I got the much more standard MCP4802. I wired it as described here, and it worked perfectly. 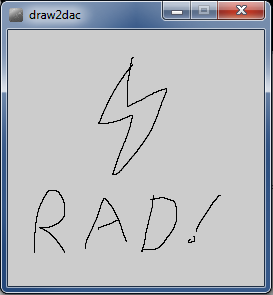 With this, I hooked up the X and Y lines to the two outputs of the DAC, and set about drawing some stuff. After getting it to draw a circle (x=cos(theta), y=sin(theta), scale output to 0..4095), I decided to draw some arbitrary stuff. // x0=-1 means "the next click is the start of a new line segment"
I wrote a small Python app to convert the CSV list of coordinates to array declarations for Arduino. (I could have done this formatting in Processing directly, but that would have involved arrays and a save function, and I’m not very familiar with Processing yet, so this was faster.) This code also drops every other coordinate to improve the refresh rate. // MCPDAC relies on SPI. MCPDAC.setGain(CH_A,HIGH); // Set the gain to "HIGH" mode - 0 to 4096mV. MCPDAC.setGain(CH_B,HIGH); // Set the gain to "HIGH" mode - 0 to 4096mV. Circuit boards, even small ones, look crazy complicated. But they really aren’t — they’re just efficiently packed. 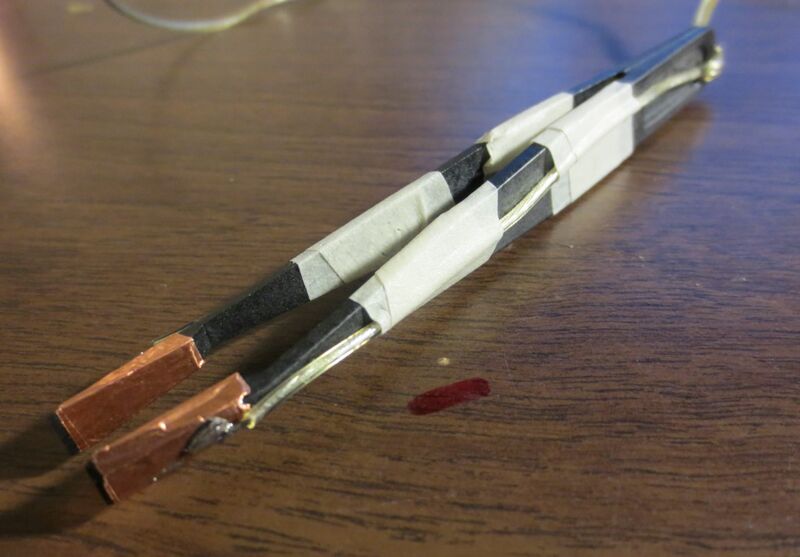 Most circuit boards have just two “layers” of copper traces running around: top and bottom. Something sophisticated like a computer motherboard can have more copper sandwiched in the middle, but most of the things a hobbyist would want to trace are just have a top and bottom. What can make tracing complicated is that the two sides work together, with a single connection flipping between top and bottom multiple times. But we can use a camera and an image editor like Paint.NET, Photoshop (the CS2 version is free now), or GIMP to make it easy. 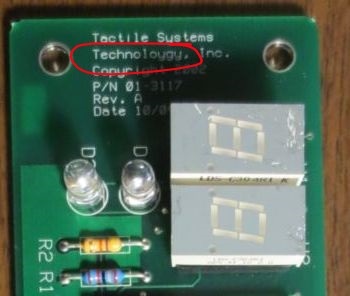 As an example, let’s trace this USB device. It’s an off-brand programmer for AVR chips that had no documentation and didn’t work in a standard way like similar products, so I had to figure to figure out how it was wired up. I started by taking good, high-resolution pictures of each side, trying to keep the camera a fixed distance from the board on each side. Using a document scanner didn’t work for this, because the board didn’t lie flat on the glass…you might be able to use a scanner for a flatter circuit board. We’re going to superimpose the bottom (simple) side over the top (complex) side in the image editor. Take the picture of the simple side, copy it, and paste it as a new layer over the complex pic. Set it to semi-transparent, flip it vertically, then use the layer transform or move tool to get it to line up exactly over the top side of the board. 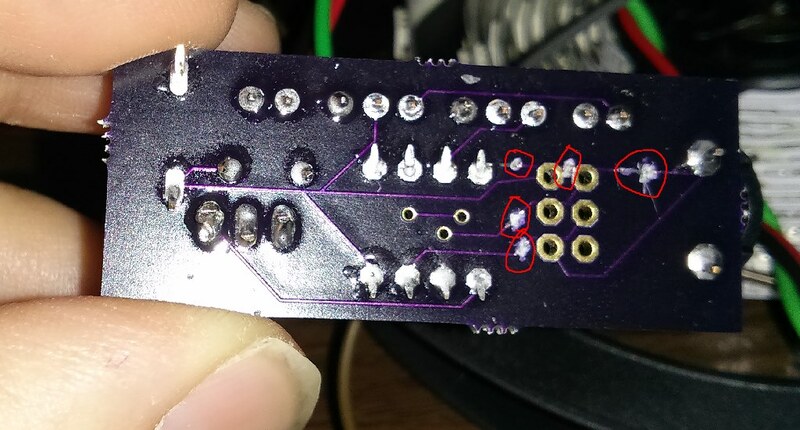 Be sure to match up key landmarks, like vias (the little holes that connect top and bottom) and through-holes. Now you can add another layer and draw additional annotations that you need until you’ve discovered everything you need to know. What I needed to know for this board was this: I was dumb to buy this $4 programmer just because it had a fancy case when the well-known good model was nine cents cheaper. It’s a crappy nonstandard board nobody’s ever heard of, and though I could fix it by adapting custom firmware for it, I’m better off just throwing it in the bin and getting the good one (which I did). 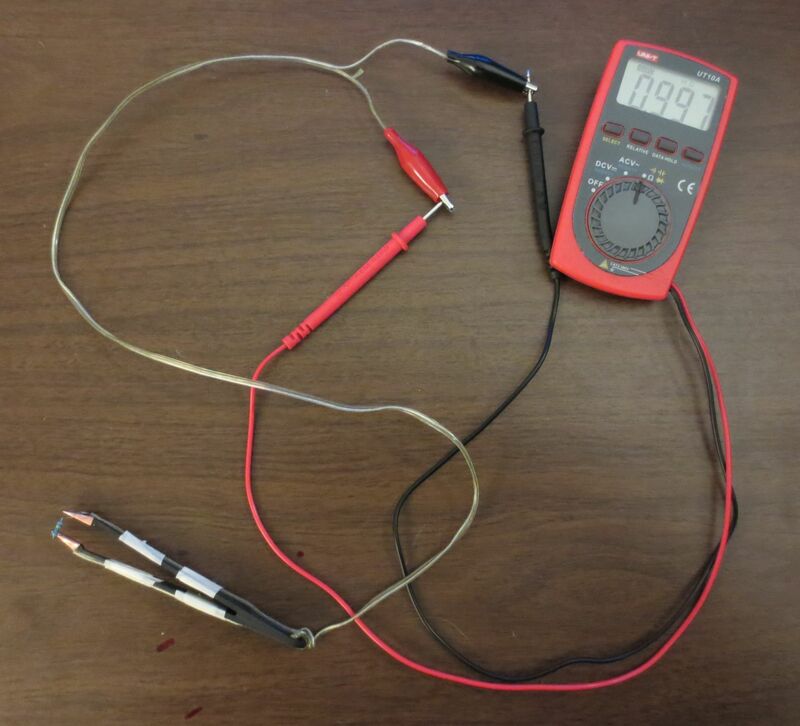 But it was a good exercise in circuit tracing.